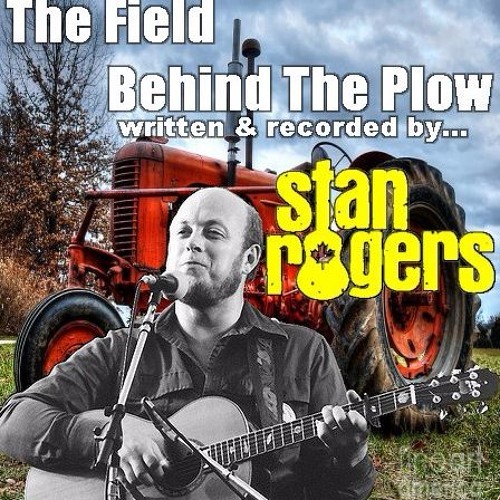 Here is a folk song written and recorded by the Canadian folk legend Stan Rogers. 'The Field Behind The Plow' is a song that comes as close as I believe is possible to describing what farm life is all about. Farming isn't a lonely existence and the banker isn't always at the door, nor are farmers holding hoe-downs and barn dances all the time. The truth is more a matter of a quiet, but constant stress occupying your mind, nearly every waking moment of the day. The struggle to make ends meet, feed the family, keep a roof over their heads and the knowledge that no matter how hard you work, the weather may come along at any moment and undo everything you have struggled for so hard. My father was a small farmer who had a large family to feed and went through floods and droughts, ever struggling to make it to the next year. Yes he had some good years, but he needed them just to make it through the hard ones. When he died I sought a song to sing at his funeral. I ended up passing on many fine gospel numbers in favor of this tune, because it summed up his life so well. I would do, for you, a cover of Stan Roger's "Field Behind The Plow" that you might have an understanding of just how hard these people work to grow the food that you buy in the Supermarkets everyday. I hope that you enjoy it.